Bunny's Chewin' The Carrot: Howzit? 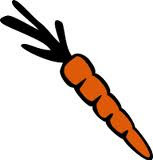 I've been chewin' the carrot over quite a few issues lately. Sonny Bill Williams, why is he so misunderstood? Well, I like the way he wears his hat, and I like his shirt. Funny guy really. Let's hope he gets some game time in the RWC. Hey, I'm just chewin' the carrot on this one. If you were talking to yourself you for got the 'off' bit.